Once upon a time, there was a Storytelling Dragon called Dalton. This soft plush dragon loved telling fairy tales. Would you like to hear his stories? Make bedtime stories magical with the Storytelling Dragon. This beautiful interactive plush tells the classic stories of ‘Hansel and Gretel,’ ‘Jack and the Beanstalk,’ ‘Rapunzel,’ ‘The Ugly Duckling’ and ‘Sleeping Beauty’. Dalton is a wonderful storyteller: he puts on a different voice for each character and builds excitement with skill. Little ones will love hearing Dalton bring new life to 5 familiar fairy tales. Dalton opens and closes his mouth as he tells his story, turning his head as though reading from the felt book he carries. You’ll even see him move with more excitement when he gets to a good bit! Simply press Dalton’s foot to see him jump into action and experience 5 classic fairy tales like never before. Hear the story of Hansel and Gretel’s breadcrumb trail, the tale of Jack’s adventures in the land at the top of theeanstalk, the Ugly Duckling’s search for acceptance, or the stories of how Rapunzel and Sleeping Beauty each found themselves stuck in the highest of towers. Dalton’s favourite fairy tales are sure to enchant your little one. 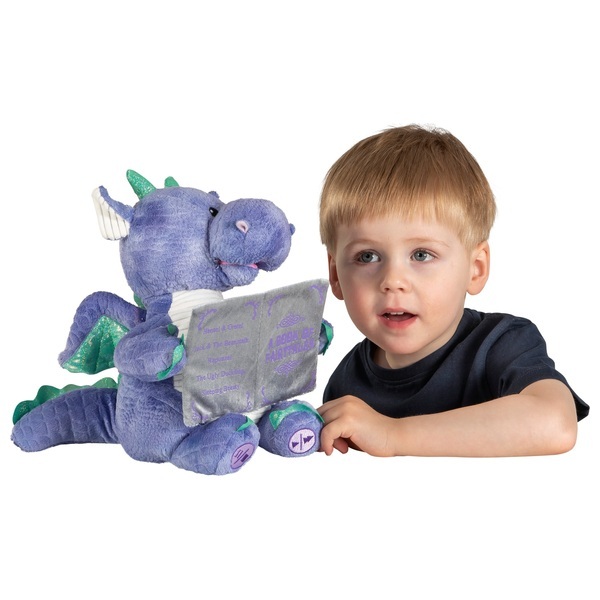 The Storytelling Dragon has a purple plush body with shiny green claws, horns, scales, and wings.